Sweden has become a powerhouse in digital music, and one of the companies leading the charge is Epidemic Sound. The company has quickly become the go-to source for creators looking to find music, with many YouTubers turning to their service to avoid the hassle of licensing. In this episode, CEO and Co-Founder Oscar Höglund shares the story of Epidemic Sound and their goal for creating a soundtrack for the internet era. 90 per cent of startups fail, but what does it take to build a business that succeeds? That defies all expectations? That could one-day become a unicorn? Hosted by Kristofor Lawson this series dives into the heart of entrepreneurship, bringing you in-depth interviews with some of the world's greatest business minds. Everyone in this series is a founder, there from the start when their idea was written on the back of a napkin and are now at the helm of a global company. Building A Unicorn is available now. Cloning has long been a fixture in sci-fi films but there's a real industry that's been developing over the past 20 years with many people now choosing to clone their prized animals. So what actually happens in the cloning process and does the rise of animal cloning mean we're just one step away from cloning humans? Twenty Thousand Hertz: Make sure you check out the amazing Twenty Thousand Hertz podcast which explores some of the world's most recognisable sounds. Just search for Twenty Thousand Hertz in your favourite podcast player, or visit: 20k.org. ActionHeat: There’s nothing worse than being out and about in winter and feeling cold, but with some clothing from ActionHeat - you don’t need to. Visit actionheat.com to check out their range of battery-heated clothing that is guaranteed to keep you warm. Listen to this episode to learn how you can save 20% off your order. Crickstart: Crickstart makes organic snacks with cricket powder and plant-based ingredients. This cricket powder is made from organically farmed, free-range crickets! So do something good for the planet and give Crickstart a try - visit crickstart.com and get 20% off with promo code MOONSHOT. TextExpander: TextExpander takes the hassle out of typing repeated information and allows you to communicate in a much smarter way. So visit TextExpander.com/podcast to save 20% off your first year (and let them know you heard about them on Moonshot). We know self-driving cars are coming - everyone is talking about them. But what impact will these autonomous vehicles have on our cities and how will they integrate with our existing city space? (This episode was first broadcast in November 2017). Autodesk: Autodesk Inventor is an easy-to-use set of software tools for 3D mechanical engineering design, documentation, and product simulation. Autodesk Inventor can help you make anything, so visit Autodesk.com/moonshot - where you can watch videos that show you more about the software, and get a full 30-day free trial of Inventor Professional. GLIDR: GLIDR is a product discovery and validation platform built to help your team develop a shared understanding of customer needs, prioritize what to build, and figure out the right way to go to market. Moonshot listeners can get 25% off their first three months at glidr.io/moonshot. GLIDR: GLIDR is a product discovery and validation platform built to help your team develop a shared understanding of customer needs, prioritise what to build, and figure out the right way to go to market. Moonshot listeners can get 25% off their first three months at glidr.io/moonshot. Backblaze: Backblaze is unlimited, cloud backup for Macs and PCs for just $5/month. Try Backblaze by getting a fully featured 15-day free trial at Backblaze.com/moonshot. Go there, play with it, and start protecting yourself from potential bad times. Don’t leave yourself at risk any longer. Ever since humans started sending satellites into space we've always neglected one very big issue - what happens when these man-made objects reach the end of their useful life? Some of the satellites will fall out of orbit, but many have remained in space for decades with no clear strategy of what to do with them. But as humans look to explore commercial space flight and populate other planets there's a growing concern that all of this space junk could pose a very real threat to our future space endeavours. So how do we actually go about cleaning up space? Francois Rigaut and James Gilbert from the Australian National University. Mike Wall from Space.com. Check out his book: Out There - a Scientific guide to Alien Life, Antimatter, and Human Space Travel. Loren Grush from The Verge. Loren has a great video series called Spacecraft available at TheVerge.com. Check out the Darknet Diaries podcast to hear stories about hackers and those that have been hacked. For more information visit darknetdiaries.com. Brad Tucker from the Australian National University. For more than a century, people have been dreaming of one day being able to build a personal flying machine. 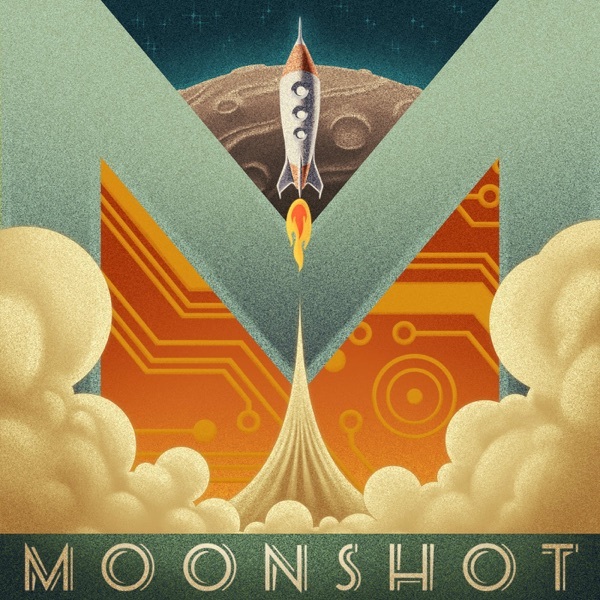 In this episode of Moonshot we meet people working on flying vehicles and jetpacks to see where the technology is headed and when we might be able to fly ourselves everywhere we go. This episode was first broadcast on September 6th, 2017. Distil Union: Imagine a life where your wallet isn’t stuffed with all those receipts. Well Distil Union has the answer. Visit distilunion.com and enter promo code MOONSHOT at checkout to receive 15% off your first order. The global population is predicted to grow to more than nine billion people by 2050, and with all those extra people will come a need to find more sustainable ways of producing our foods. Square Roots was founded by Tobias Peggs and Kimbal Musk in 2016, and is just one of the companies which is driving an urban farming revolution. Square Roots is building vertical farms in shipping containers, and training a new generation of farmers, in their quest to bring food production closer to where people actually eat it. Cover: Don't waste time trying to find insurance. Cover is an app designed to make finding insurance easy. Just take a picture on your phone and Cover will search over 30 providers for the best rate. Save time and money with Cover - visit cover.com/moonshot to get started. 3D printing has taken the world by storm - we can print everything from the tiniest parts for a model robot, to jet engines, and even entire buildings. But one of the biggest revolutions in 3D printing is only just starting to take shape, and that’s the idea of having 3D printed food. There are many startups building technology for the small satellite market, but there actually aren't many places where you can launch them. In this episode we meet Peter Beck, the Founder and CEO of Rocket Lab - a company building launch vehicles (i.e rockets) for the small satellite market, and which has built their own rocket launch facility on the east coast of New Zealand. Satellites have changed the way people live and communicate - we use them for everything from accessing the internet, to television, and even GPS. While traditional satellites are big and expensive, there are many new companies embracing the small satellite market in an effort to reduce costs. In this episode of Moonshot we meet Flavia Tata Nardini, the CEO of Fleet Space Technologies, an Australian startup that's building a constellation of nano-satellites to power the internet of things. The world is slowly moving towards one powered by renewable energy. Currently renewable energy largely means hydro, wind, solar, or geothermal, but what forms of clean energy will we see in the future? And how will we store that energy for use in electric cars or even spaceships? Flash Forward: Check out another podcast about the future - visit flashforwardpod.com to learn more. Artificial Intelligence systems are becoming increasingly prominent in our society. They power everything from robots, to self driving cars, and even many websites. But how do humans make sure we stay in control of these robotic systems? In this episode of Moonshot we speak with Nell Watson from Singularity University and OpenEth.org to find out why humans need a code of ethics for AI. Alphabox: Alphabox briefs come in super cool and fun prints and as well as some classic colours. Visit Alphabox.com and enter the promo code ‘MOONSHOT’ at checkout to receive 15% off your first order. VideoBlocks: Get studio-quality footage for a fraction of the cost with VideoBlocks. Head to videoblocks.com/moonshot to get all the stock video you can imagine for just $149 a year. Wordpress.com: Every business needs a great website. So if you're looking for a new website sign up for Wordpress.com at Wordpress.com/MOONSHOT and receive 15% off your brand new website. What new products and technologies are going to take off? And which ideas are worth investing in? Kevin Rose is a serial entrepreneur and currently an investor with True Ventures. Kevin was an early investor in Twitter and Foursquare, and previously founded Digg.com along with other companies like Revision3, Milk, and North Technologies. We chat to Kevin about what ideas he's interested in, where he feels technology is heading, and why he won't be investing in VR. What does it mean to be human? And what would be possible if you had technology hardwired into your mind? Bryan Johnson is the founder and CEO of Kernel - a company building chips to implant in your brain to fix problems and improve human potential. Bryan was previously the founder of Braintree which sold to eBay for $800 million USD. He's now invested $100 million to make sure humans don't fall behind in our pursuit of new technology. Join us as we dive into the human mind with Bryan Johnson. Entrepreneur Michael Pryor shares the story behind Trello - the visual productivity app that's changing the way people organise their businesses and their lives. This week on Moonshot: Researchers have spent decades trying to build machines that have the ability to think and reason like humans. But how close are we from reaching the point of Artificial General Intelligence? If you're a billionaire with lots of money there's no better way to spend that cash then to try and send other humans to Mars. But is Mars space travel really something that could be a reality in less than a decade? Moonshot explores the race to Mars and the people trying to make it happen.